What did Dylan have to say competition? The youngest member of the Tambo Teddy family, Dylan, is now eight months old and becoming a real character. Being very mobile (the fastest crawler in Tambo!) he can cut some moves around the shop on a Saturday morning – and the best fun is exploring! Ribbons, tags, teddies….anything within reach. Dylan managed to sit still long enough for us to catch a couple of piccies of him and we thought it would be fun to run a competition to see what people thought he might be saying (if he could talk!). Loads of emails and Facebook comments later we selected our favourite caption sent in via Facebook by Lani Wain. It is a fair guess that Dylan will be lining up for the mutton busters in a few years! We received over 200 entries in this competition but there can only be one winner and we chose Lani’s entry because it made us laugh, was short and to the point and mentioned a teddy. The photo we used for the competition was very cute… but a little out of focus, so we decided to have another photo shoot, however our gorgeous little boy wasn’t that co-operative and kept burying his face in the rug! Cute, but not quite what we were after, but there was one shot that made the grade. 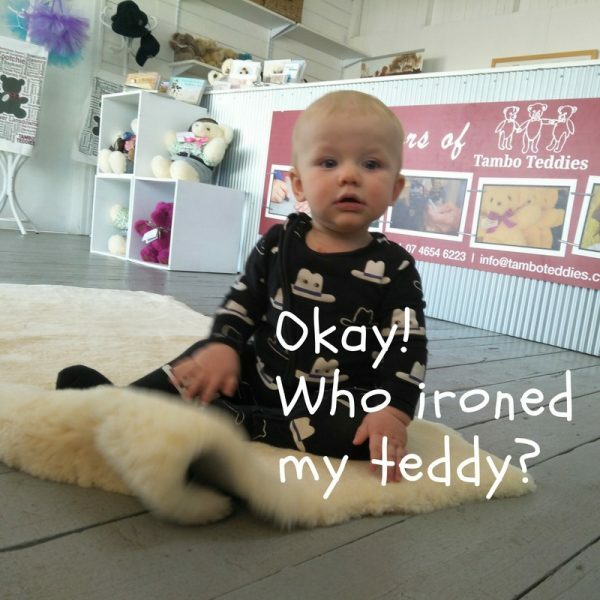 And using this great caption we will use this image to promote Tambo Teddy sheepskins which can be purchased online here.